I make! Buttermilk berry muffin edition | Random moosages as I see fit. I have had a huge craving for muffins recently. I don’t really know why. In particular, I wanted raspberry muffins, which is weird because I’ve never had raspberry muffins before. I had a friend in Canada who would often get a raspberry muffin during his coffee break and would tell me about it. But that’s about the only exposure I’ve had with raspberry muffins. It did make me really jealous though. The muffins he got sounded so delicious. And there are no raspberry muffins to be found in CA for some reason. Anyway, I’ve had some time off recently and I had been filling my time with YouTube videos on cooking because I wasn’t really in a position to do anything else that was productive. During my marathoning of various YouTube videos, I found the Joy of Baking channel and on it, there is a recipe and demonstration for buttermilk berry muffins. PERFECT. I made these one Friday with the girls and instead of using mixed berries, I used up the raspberries I had in the freezer. Unfortunately, I didn’t have any buttermilk on hand that day, so I used milk and lemon juice as a substitute. They turned out pretty good, but missing the fragrance and flavor you get with buttermilk. I had also cut down on the sugar the first time to about 120g. I’ve decided it’s not necessary. Her recipe isn’t sickly sweet to begin with and using the full amount of sugar she calls for is perfectly fine. So I tried the recipe again, this time with buttermilk. Actually, I ended up just getting a canister of powdered buttermilk because I’m tired of always going on last minute hunts for buttermilk when I need to use it in a recipe. Now I have lots of buttermilk! And it’s easy to use in baked goods! Anyway, the second time I tried it, I used up the blueberries in the freezer. They baked up really nicely and they look so nice coming out of the oven and they smell so good (they taste good too, in case you’re wondering). 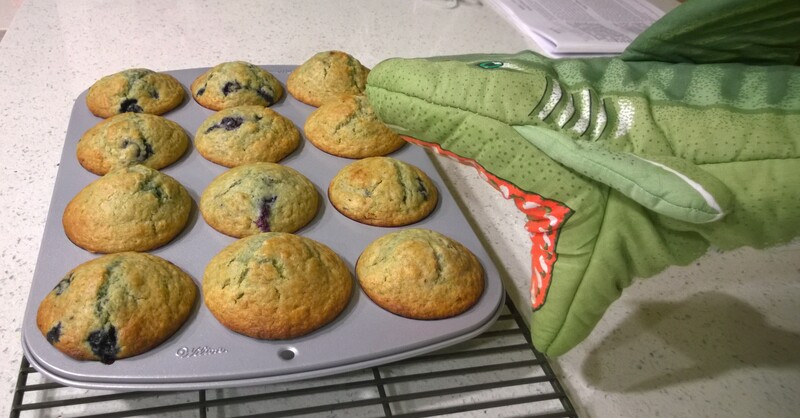 So good, that even sharks want muffins. I have the best oven mitts, guys.